Another HR Weekend will be organised by De Balie Feb. 8-10, 2019. You can find more details here. Since the Chinese Government signed the United Nations Convention on the Rights of the Child in 1990, The Law on the Protection of Minors with the relevant policies and legal instruments have been enacted. A pilot practice on child protection was launched in 2013. The third amendment to The Law on the Protection of Minors and the first formulation of a Regulations on Child Welfare are currently being prepared. A number of studies have been conducted on this topic by Professor Dongping Qiao. From the socio-cultural perspective, her research has found that China has its particular concept, classifications, concerns, approaches and systems on child protection. Her recent research illustrated the latest developments and trends of child protection policy and legislation in China. Prof. Qiao will share her experiences and insights on these issues. Time: Starting 15:30 (sharp), Thursday, 30 August 2018. 40-minute talk, followed by around 30 minutes’ discussion. Location: Room 110 in Janskerkhof 2-3 (the first floor), Utrecht City Centre. My current work focuses on China’s role in the evolutionary process of human rights, where cultural compromise and integration deserve due attention and scrutiny in this globalising era. This process has been experiencing three phases, namely, neutralisation, differentiation and harmonisation. In my talk, I will first analyse China’s modern human rights interpretations by a Chinese philosopher and human rights activist Zhang Peng Chun (a.k.a. Peng Chun Chang), whose cultural perspective (the Chinese culture and Confucianism in particular) to a very large degree is still valid today. I will then outline China’s contemporary human rights interpretations, where State stability and individual rights are balanced, the right to development is deemed as the core of human rights, and collective rights has revived in the recent pursuit of building a community of the shared future for humankind. Speaker: Professor Chang Jian is a leading Chinese scholar in the field of human rights theory, public conflict management, and government studies. Prof. Chang’s reputation has been well established for his influential books, including: “The Chinese Road of Human Rights” (published in 2016), “Human Rights Policies in China” (published in 2016), “Efficiency, Justice, Stability and Government Responsibility” (published in 2010), “ Transformation of Rights in China” (published in 2000), and “The Ideal, Paradoxes and Practices of Human Rights” (published in 1992). Prof. Chang has (co-)edited well received works such as “Training Handbooks of Human Rights for Public Servants”, “Annual Reports on China’s Human Rights (Blue Book Series)”, and “Human Rights Action in China”. He currently directs the Center for the Study of Human Rights at the Nankai University, and serves as Standing Council Member of the China Society for Human Rights Studies. Human Rights and Development in Africa – Actualizing the Right to Development: what will it take? The event is supported by the CCHRC. Theme 8: Actualizing the right to development: comparative analysis, case studies from other regions, and from a multi and transdisciplinary perspectives. The “2018·China-Europe Human Rights Seminar” will be held from June 27 to 29, at the College of Europe in Bruges, Belgium. It will be co-sponsored by China Society for Human Rights Studies and the College of Europe. The Main Topic of this seminar is “Diversity of Civilization and HumanRights”. Theory and Practice of Human Rights in a Pluralistic World. Human Rights Perspectives of East and West. Dialogues on Human Rights among diverse cultures. Consensus on Human Rights among diverse cultures. Multi-cultural implementation of the Universal Declaration of Human Rights. 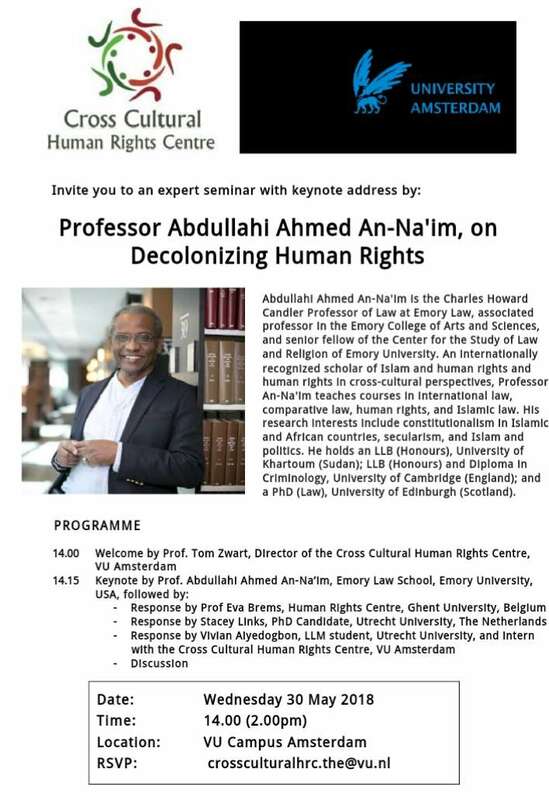 Key note speech presented by: Prof. Abdullahi Ahmed An-Na’im, Charles Howard Candler Professor of Law at Emory Law. Location: VU Campus Amsterdam, 2nd floor of the Main Building; room HG02A24. The School of Law of Shandong University (China) and the Cross Cultural Human Rights Centre co-organized a seminar on the theme ‘Building a Community of Shared Future for Mankind in the Area of Human Rights’. The seminar took place in the port city of Qingdao, where Shandong University is constructing a new campus. Panel 4: What would a community of shared future for mankind look like in the area of human rights? The seminar drew participants from all continents.